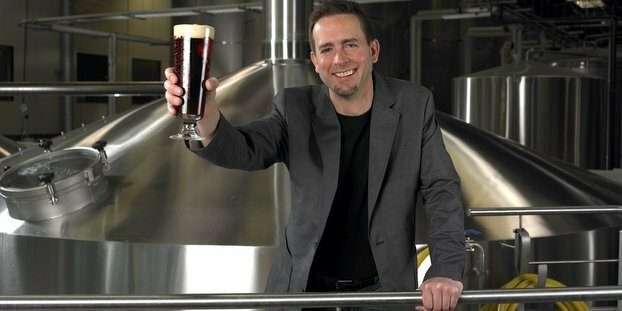 We mentioned back in March that Stone Brewing Co. was taking craft beer where it has never gone before, thanks to a collaboration with Star Trek: The Next Generation alum Wil Wheaton. The Stone Blog reported that Wheaton, you may remember him as Wesley Crusher, is an avid homebrewer, friend of Stone co-founder Greg Koch and supporter of all things Stone. Along with fellow friend Drew Curtis, Fark.com founder, the collaboration took place on April 3 on a to-be-announced beer. Well that beer has been announced to be coming out in July, called w00tstout. In early April, Stone Brewing Co. Co-Founder and CEO Greg Koch had super geek buddies Curtis and Wheaton come down to the brewery in order to brew this super-secret next generation beer. What was totally unexpected (or maybe expected?) is that we would discover a dark secret about Mr. Wheaton. We’ll let the video above show you Wheaton’s secret shame and also Koch’s magnificent, Jesus-like beard. @CraftBrewingBiz @StoneBrewingCo @wilw “Nothing! Washing my hands!” Awesome! We’re all a bit hooked.